Red Carpet Landscaping can give you back your weekends and free time. Instead of fighting with a push mower, breaking your back with a rack or a shovel. You could be enjoying your free time at home with your family, playing with your kids, or just sitting down for dinner and a movie with your spouse. If you want the free time, your in luck. 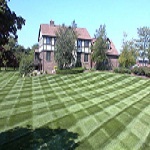 Give Red Carpet Landscaping a call for lawn service Greenwich, so you can start to enjoy your free time. call today for your free estimate at (203) 212-2498 or you can email us at customerservice@redcarpetlandscaping.com. Red Carpet Landscaping mowing includes more then just a simple lawn mowing. Edging with a steel blade along driveways, patios, sidewalks, and patio’s. Detailed line trimming where the lawn mower does not reach and along fence lines, trees, mailboxes, flower beds, and misc. posts. Removal of any debris and excess trimmings. Weekly or bi-weekly mowing services. We’ll neatly trim and mow your lawn every week. Our mulching mowers chop up the clippings for absorption as additional nutrients for your lawn. Your neighbors will be envious. In addition to mowing, this service includes impeccable trimming. Make any flower bed stand out with mulch. It will also help prevent weeds. If you have a garden or flower bed, we can help it look spectacular. Colorful seasonal flowers can add that extra highlight to you front and back yard. This includes aeration, detaching and overseeding, as well as a general cleanup of your yard and planters. It should be done at least once a year. If you have a large amount of trees, then it might be time to call us so we can take care of all the leaves that fall. A very important service if you want your hedges and bushes to look there best. Please feel free to call the Red Carpet Landscaping Professionals for all of your Darien Lawn Service Needs at (203) 212-2498 for a FREE Estimate.